Adam Lambert and Metallica go together like...Well, we're still pondering that. Nonetheless, the American Idol runner-up surprised pretty much everybody in the audience on Sunday (17 October) at his gig in Auckland, New Zealand, when he covered Metallica's Enter Sandman as a birthday present for his bass player, Tommy Joe Ratliff. Although metal might not be the first thing that comes to mind when you think Adam Lambert, his touring band does include guitarist Monte Pittman, who appears on five albums with Prong, including 2007's Power of The Damager and 2009's remix release, Power Of The Damn Mixxxer. 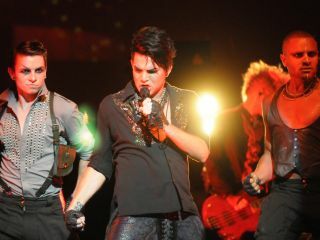 Lambert's gesture was a big hit, it seems, at least with his band. After the show, Ratliff Tweeted, "Just got THEE sickest early bday present ever! Got to play Enter Sandman on stage with the baddest singer and band ever!!!! thank you guys!" while Pittman said in a follow-up Tweet, "We surprised Tommy by doing 'Enter Sandman'-Metallica for his birthday! Happy Birthday Tommy! We only got to rehearse once." So what do you think? Did Lambert and co do the song justice...for all?